Rookie Steven Scheu hopes to master his tight end position — and earn his master’s degree somewhere along the line. FOXBOROUGH — Steven Scheu is just beginning his journey into the NFL, having signed as an undrafted free agent with the Patriots last week, but he’s already thinking about the next thing: working toward his master’s degree, be it post-football or perhaps in the offseason. 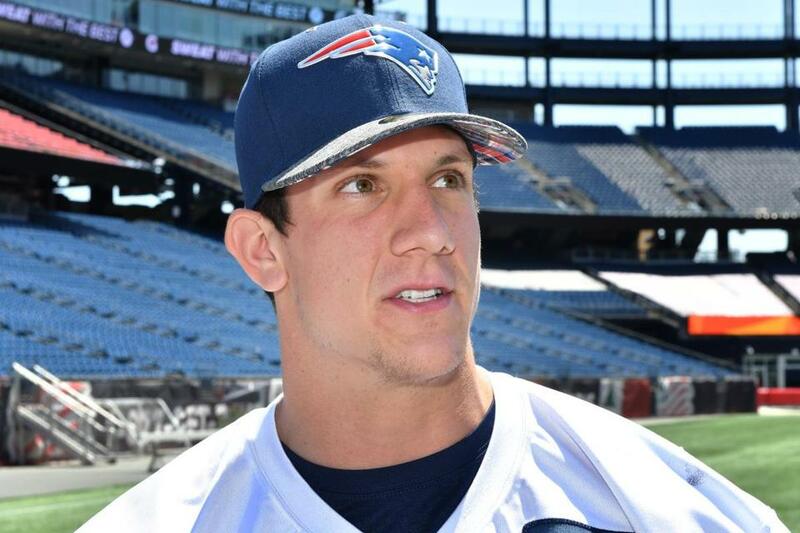 Scheu, a tight end from Vanderbilt who at 24 come July is among the oldest of this year’s rookies, is one of the latest examples of the Patriots valuing intelligence. Brains alone won’t get you a job with the Patriots; talent and work ethic are critical. But having smarts doesn’t hurt. The Patriots’ employment of defensive coordinator Matt Patricia (aeronautical engineering, RPI) and offensive lineman Cameron Fleming (aeronautics and astronautics, Stanford) shows that. In addition to Scheu, sixth-round pick Ted Karras was a three-time Academic All-Big Ten honoree, and rookie free agent D.J. Foster pulled in a 3.92 GPA his final semester at Arizona State. At Vandy, Scheu’s major was Medicine, Health and Society, which he said was basically health administration. He took classes with lots of pre-med students. Karras, a guard, said his good grades were simply the product of doing what he signed up to do. It’s been only a handful of days since the newest crop of Patriots signed their first professional contracts. As the eight offensive rookies stood on the Gillette Stadium turf Wednesday, meeting with the New England media for the first time, it showed. The wide-eyed, happy-to-be-here shine hasn’t worn off. “To finally be here and doing it and looking around and seeing the Patriots logo everywhere, being in the stadium — it’s a really surreal feeling,” Scheu said. They spoke carefully, showing reverence when it came to their coaches. All they want to do is come here and work every day, you know. One of the best videos to come out of draft weekend had nothing to do with the draft. Foster, a running back/wide receiver from Arizona State, wasn’t selected in the seven-round draft. After the final pick was made, he began fielding phone calls from teams looking to sign him as an undrafted free agent. When he chose the Patriots over the Texans and his hometown Cardinals, he called his grandmother and could barely get the words out because he was so emotional. Foster said he forgot that a local television crew had placed a microphone on him; it picked up what he thought was a private conversation. The clip quickly went viral. “It was amazing,” said Foster. “I forgot I was miked up, but it ended up being good. So people understand where I was coming from. The versatile Foster had a productive four-year career with the Sun Devils, twice being selected for All-Pac-12 honors. He finished with 2,458 receiving yards and 2,355 rushing yards, one of only five players in Division 1 history to rush and receive for more than 2,000 yards. Foster was a full-time receiver for the first time in his senior season. The Patriots list him as a running back. Williams, a 6-foot-6-inch, 258-pounder, has been a Patriot for six days. That’s not even close to the family record for time spent with the organization. A relative, Brooks Williams, spent six seasons in the NFL (1978-83), including 1983 in New England. Bryce’s ECU bio calls the two cousins, but Bryce clarified that they’re second cousins “or something along those lines.” Bryce said he never met Brooks, who died in 2008. Brooks, who also was a tight end, played in 13 games (one start) for coach Ron Meyer’s Patriots, but it won’t take much for Bryce to surpass his production. Brooks managed one catch, on a pass from quarterback Steve Grogan, for no gain . . . The Patriots released linebacker Tony Steward, who was signed April 22.